WATKINS GLEN, N.Y. – Denny Hamlin, winner of Sunday’s Cheez-It 355 at the Glen, entertained a sold-out grandstand with a celebratory burnout that trailed a plume of smoke the entire length of the frontstretch at Watkins Glen International. But Hamlin’s smoke show—with a bad back, no less—paled in comparison to the fireworks that preceded the checkered flag, Hamlin’s first at a NASCAR Sprint Cup Series road course. The race was in doubt until the final corner, with Martin Truex Jr. pressuring Hamlin, who led the final 10 laps after surging past Brad Keselowski and Kyle Busch in Turn 1 following a Lap 81 restart. But Truex never got a chance to drag-race Hamlin’s No. 11 Joe Gibbs Racing Toyota to the finish line. As the cars neared the exit from Turn 7, with Truex running second and Keselowski third, contact from Keselowski’s No. 2 Ford sent Truex’s No. 78 Toyota spinning. Defending race winner Joey Logano took advantage of the melee to finish second ahead of Keselowski and 2014 Watkins Glen winner AJ Allmendinger, who knocked Kyle Larson off the track and into the inside barrier on the way to a fourth-place finish. Tony Stewart recovered from an early mistake—blowing the inner loop and losing 10 positions in the process—to finish fifth. Kyle Busch was sixth and Truex seventh after the last-lap spin. Hamlin won the race in pain, with nerve endings on fire in his back. “I just woke up with back spasms this morning,” he explained. “Just hits me every three or four months or so. I just wake up and can’t move. Really doubted being in the race car today, to be honest with you, but can’t say enough about this whole FedEx Freight Toyota team. 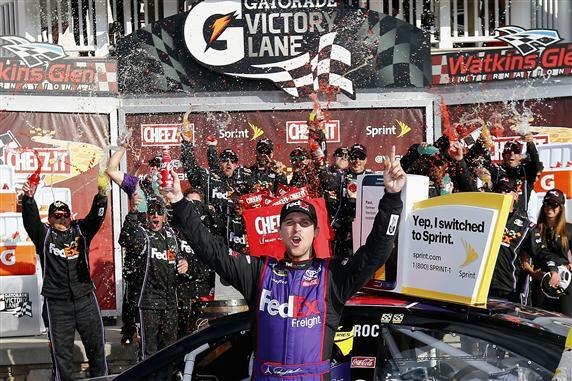 For the second straight year, the Daytona 500 champion also has gone to Victory Lane at the 2.45-mile Watkins Glen road course, with Hamlin joining 2015 winner Logano in that accomplishment. The victory was Hamlin’s second of the season and the 28th of his career, and though Hamlin was in a mood to celebrate, there were plenty of hurt feelings behind him. Keselowski took responsibility for the incident with Truex, who expressed his displeasure by banging fenders with the No. 2 car on the cool-down lap. “I got right up to the bumper of the 78 (Truex) and couldn’t do anything there, and he made a move to get by the 11 (Hamlin) on the inside, and the 11 blocked him,” Keselowski said. “I went high, and the 78 went high and by then I was already deep in the corner and got into him and turned him. That was really unfortunate, and the last thing I wanted to see. That craziness included eight cautions for 20 laps, four for multicar incidents in the final 38 laps. There were two yellows after Hamlin took the lead on Lap 81, when Kyle Busch and Keselowski ran wide in Turn 1, and Hamlin seized the moment. After the final restart on Lap 87 of 90, Truex stayed close to Hamlin, almost getting to the bumper of the No. 11 in the final corner before the contact from Keselowski turned him. The ensuing chaos allowed Hamlin to cross the finish line 2.065 seconds ahead of Logano for a victory that was nowhere near as comfortable as that margin might seem to indicate. It was an ending befitting a race track accustomed to wild racing. Notes: With his car obliterated in a four-car wreck on lap 53, Jimmie Johnson finished last (40th) in a Sprint Cup race for the first time in his career. … Danica Patrick led 11 laps on Sunday, a career best for a single Sprint Cup event, exceeding the seven laps she had led on two occasions at Talladega. … The victim of an early accident, Jeff Gordon recovered to finish 14th in relief of Dale Earnhardt Jr., who missed his fourth straight race because of concussion-like symptoms.